June 10, 2018 - by Leon Hammack - 16 Comments. Sonoma Raceway, formerly Sears Point Raceway and Infineon Raceway is a 2.52-mile road course and drag strip located on the landform known as Sears Point in the southern Sonoma Mountains in Sonoma, California, USA. The road course features 12 turns on a hilly course with 160 feet of total elevation change. It is host to one of only three Monster Energy NASCAR Cup Series races each year that are run on road courses (the others being Watkins Glen International in Watkins Glen, New York and the Bank of America 500 at Charlotte Motor Speedway in Charlotte, North Carolina). It is also host to the Verizon IndyCar Series, the NHRA Mello Yello Drag Racing Series, and several other auto races and motorcycle races such as the American Federation of Motorcyclists series. Sonoma Raceway continues to host amateur or club racing events which may or may not be open to the general public. The largest such car club is the Sports Car Club of America. In 2002, Sears Point Raceway was renamed after a corporate sponsor, Infineon. However, as with many renamings of sports complexes, many people still call it by its original name. (It was never affiliated with Sears, Roebuck, and Company, having been named for the nearby Sears Point Ranch founded in the 1850s by settler Franklin Sears.) On March 7, 2012, it was announced that Infineon would not renew their contract for naming rights when the deal expired in May, and the track management is looking for a new company to take over naming rights. Until it can find a new corporate sponsor, the course is simply identifying itself as “Sonoma”. The 2.52-mile road racing course was constructed on 720 acres by Marin County owners Robert Marshall Jr., an attorney from Point Reyes, and land developer Jim Coleman of Kentfield. The two conceived of the idea of a race track while on a hunting trip. The ground was broken in August 1968 and paving of the racing surface was completed in November. The first official event at Sears Point was an SCCA Enduro, held on December 1, 1968. In 1969 the track was sold to Filmways Corp., a Los Angeles-based entertainment company for $4.5 million. In May 1970 the track was closed and became a tax shelter for Filmways after losses of $300,000 were reported. Hugh Harn of Belvedere and Parker Archer of Napa arranged to lease the track from Filmways in 1973. Bob Bondurant, owner and operator of the Bob Bondurant School of High-Performance Driving, and partner Bill Benck took over management and control of the leased raceway from Parker Archer and Hugh Harn in 1974. A few years later a group calling itself Black Mountain Inc., which included Bondurant, William J. Kolb of Del Mar and Howard Meister of Newport Beach, purchased the track from Filmways for a reported $1.5 million. American Motorcycle Association national motocross races in the hills north of Turn 7 became popular with Bay Area fans, but were phased out by the end of the decade because of rising insurance costs. In 1981 Filmways regained ownership of the track after a financial dispute with Black Mountain group. Jack Williams, the 1964 NHRA top-fuel drag racing champion, Rick Betts and John Andersen purchased the track from Filmways at an auction for $800,000. The track was renamed Sears Point International Raceway. In 1985 the track was completely repaved, in part with funds donated from the “Pave the Point” fundraising campaign. The first shop spaces (buildings A, B, C, and D in the main paddock area) were built. In 1986 Harvey “Skip” Berg of Tiburon, CA took control of the track and became a major stockholder in Brenda Raceway Corp., which controlled the track until 1996. Additional buildings constructed on the property brought shop space to more than 700,000 square feet during 1987. In addition, a five-year contract was signed with the National Hot Rod Association for the California Nationals. The NASCAR Winston Cup Series debuted at the raceway in 1989. In 1994 more than $1 million was spent on a beautification project and construction of a 62-foot (19 m)-high, four-sided electronic lap leaderboard in the center of the road course. In the following years, a major $3 million renovation plan included VIP suites and a two-story driver’s lounge/emergency medical facility. In 1995 Trans-Am and SportsCar races returned to Sears Point and the NASCAR Craftsman Truck Series was added to the major-events schedule. Owner “Skip” Berg sold the track to O. Bruton Smith, chairman of Speedway Motorsports, Inc. in November 1996. Major renovations began at Sears Point Raceway in 1998 with the creation of “The Chute”, an 890-foot high-speed stretch. The first-ever running of the American Le Mans Series took place at Sears Point in July 1999. In 2000 Sears Point Raceway gained unanimous approval from the Sonoma County Board of Supervisors by a 5–0 vote to begin work on a $35 million Modernization Plan that included 64,000 Hillside Terrace seats, repaving of both the road course and drag strip and increased run-off around the entire track. • The Sonoma Raceway road course features more than 160 feet of elevation change from its highest point (Turn 3a, 174 feet) to its lowest point (Turn 10, 14 feet). • The berms on the turns of the road course are painted blue and gold at the suggestion of raceway President and General Manager Steve Page, who attended UC Berkeley. • The property on which the raceway was built was a working farm called Sears Point Farm in the early 1900s. • The raceway houses a motorsports industrial park of more than 70 businesses in 104 shops. • In 2011, in a partnership with Panasonic Corporation of North America, the raceway completed a solar installation of nearly 1,700 solar panels, which offsets approximately 41% of the raceway’s energy usage. • Drivers who complete the Toyota/Save Mart 350 Monster Energy NASCAR Cup Series race will make 1,100 turns around the road course. The race spans 110 laps. 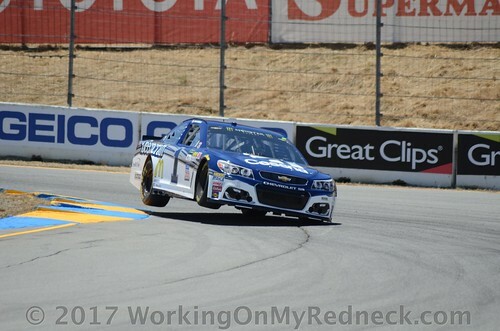 • The NASCAR configuration of the Sonoma Raceway road course is lined with 1,000 tire packs made up of 25,000 tires, 90,000 screws, 90,000 clips and 180,000 washers. • Mat Mladin (AMA), Josh Hayes (AMA), Doug Kalitta (NHRA, Top Fuel), John Force (NHRA, Funny Car) and Jeff Gordon (NASCAR) are the only riders/drivers to three-peat in a major racing series in Sonoma. • Nearly 4,000 sheep, housed at the raceway and provided by Rocky Mountain Wooly Weeders, provide natural land care, helping to maintain the facility’s grasses and fire lanes. • Winners in Sonoma celebrate with a sip from the Champion’s Goblet in Sunoco Victory Lane. The goblet, which is handcrafted by a local glass blower from Sonoma, was introduced in 2006 and incorporates the raceway’s rich wine country heritage. • The raceway has collected more than 475 tons of materials (950,110 pounds) since the inception of its recycling program in 2004. • Through the Track Ambassador program, the raceway engages approximately 300 volunteers to help around the facility during event weekends and at various promotional and charitable activities throughout the year. • The raceway donated 8,045 event tickets valued at more than $418,356 to Northern California non-profit organizations in 2014. • Levy Restaurants partnered with 14 local non-profits who worked in concession stands during event weekends in 2014. These groups received more than $76,000 for their efforts. • Sonoma Raceway is home to 15 owl boxes, which encourage owls to nest and help with natural rodent mitigation.